According to the Canadian Breast Cancer Foundation, one in nine Canadian women is expected to develop breast cancer during her lifetime. In 2013, there will be an estimated 23,800 Canadian women diagnosed with breast cancer. Survival rates increase significantly with early detection through regular screening. However, for women with disabilities, early detection is significantly less likely than for non-disabled women. Throughout the month we will be sharing resources and information to raise awareness of the challenges faced by women with disabilities in accessing adequate cancer screening and treatment. To receive DAWN Canada’s newsletters in your inbox subscribe here! Watch for video messages and blog posts from disability advocates as well as a tribute to the late Maria Barile, long-time disability activist who fought for equitable access to cancer treatment for women with disabilities. 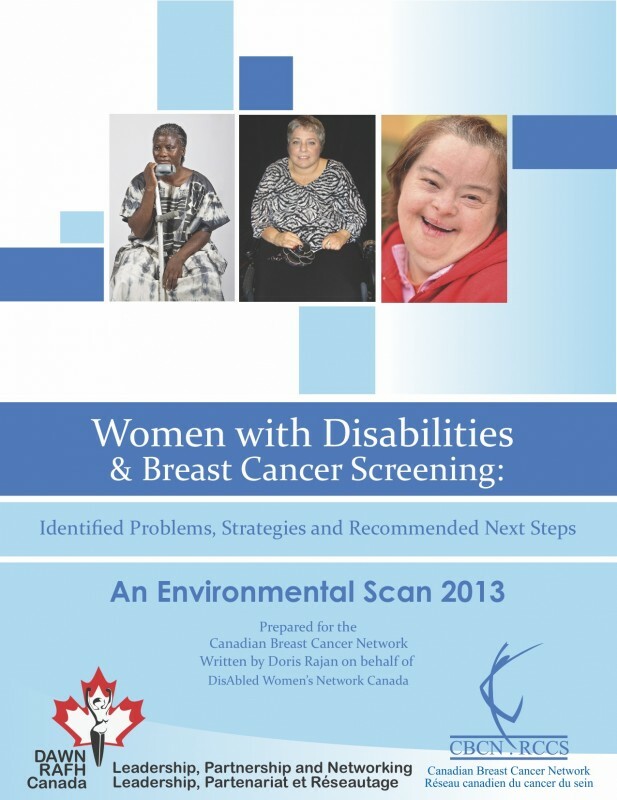 A 2012 report entitled “Environmental Scan on Women with Disabilities & Breast Cancer Screening: Identified Problems, Strategies and Recommended Next Steps” examined existing research on women with disabilities and access to health services, in particular, to breast cancer screening. The report was prepared by DAWN-RAFH Canada on behalf of the Canadian Breast Cancer Network. According to Doris Rajan, author of the report and senior consultant with DAWN-RAFH Canada, the report revealed that there are a number of barriers for women with disabilities and Deaf women to access breast cancer screening, from the obvious physical ones like examination tables being too high to attitudinal and procedural barriers as well. The report’s key recommendations include: addressing physical barriers, i.e. adapting equipment and medical procedures; conducting women-centered, disability sensitive training for breast cancer screening health care personnel; developing disability-positive outreach and health promotion materials in various formats for non-verbal, low-literacy or non-English speaking women; and finally, implementing broader policy reforms.